Rolls-Royce Marine is currently developing a new solution for various stakeholders working in the harbour area to increase their situational awareness on shore. It was our task to help imagine and visualize ways that would support such vision by developing a user interface that would provide dynamic data in an attractive and accessible way. 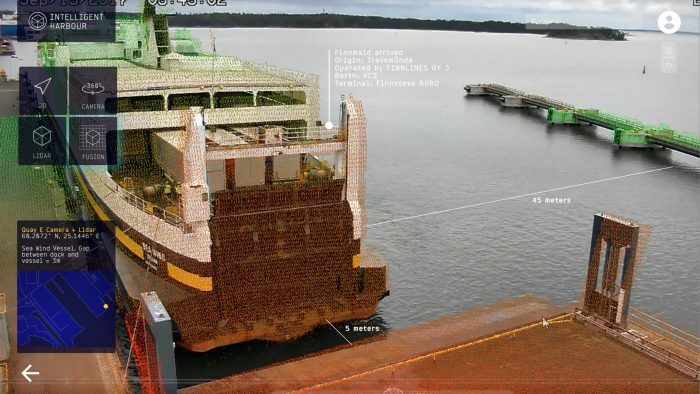 The inspiration for this ambitious project comes from ship situational awareness, a product which Rolls-Royce Marine has been developing previously. As we learned, situational or intelligent awareness refers to the perception of elements and surroundings around us. On a higher level, such awareness means knowing what is happening and being aware of the status of systems, especially in case something changes constantly. As any harbor environment is highly complex with dozens of operations happening simultaneously, building such awareness is crucial. The 3 experience goals of our project are: TRUST, CONFIDENCE and EXPLORATION. We want to spark creativity and an Exploration mindset to new data experiments, which will be possible in an atmosphere of Trust and Confidence. By providing a UI with new ways to show and share information, we aim to evoke the mindset for exploring – everything is possible when you implement new data types and algorithms. Our main Xgoal is Trust with its subgoal Confidence. Trust rose as an Xgoal in a very early phase of our research. As data is not shared widely, misunderstandings happen and communication can be a challenge, an objective, shareable information source would increase trust in the harbor site and beyond. Trust is also very closely related to Confidence – believing you can achieve and accomplish goals. More accessible information in a convenient form helps get new insights on your surroundings and help make better decisions. 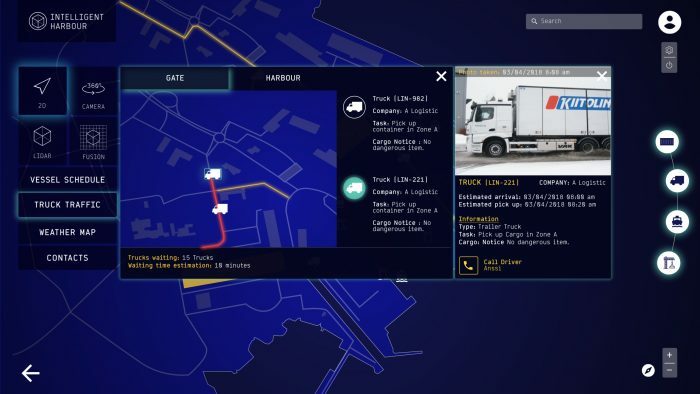 Harbor situational awareness UI aims to be a tool to share real time information, work load processes, schedules and different insights from harbor. The situation or work queues in harbor can be communicated in few seconds – removing misunderstandings and slow communication via old information sharing channels. Even customers outside harbor can be presented with the situation and work load time estimates in harbor in real time. This new level of openness would remove barriers between stakeholders and create an atmosphere of trust and mutual benefit.